It's hard not to compare Nine Parchments to several popular franchises. The game takes elements from Diablo and Harry Potter and blends them into an interesting and engaging game narrative. This is a twin-stick, shoot-em-up featuring wizards, monsters and powerful spells with an emphasis on exploration and collecting loot. 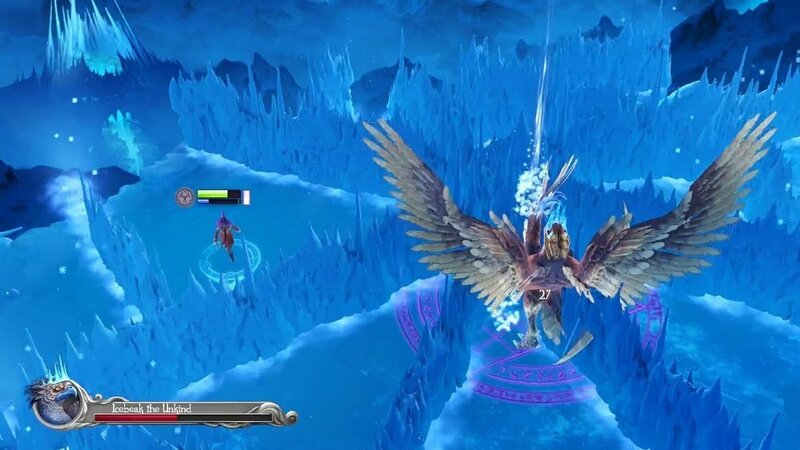 Nine Parchments a fairly unique title with it's main strength being it's Co-op gameplay and sense of fun in a beautifully constructed, colorful environment. An explosion at the Astral Academy for young wizards scatters nine magical parchments to the four winds of the Earth, prompting a group of students to begin a quest to retrieve them. The story is fairly unique in the sense that there's no overarching sense of doom, nor is the world is not at stake allowing for a lighthearted romp through a beautiful magical environment. It's not a very involving narrative, but it's enough to hold the player's interest and manages to tie all the manic action together as a cohesive whole. Beautiful visuals and smooth controls really help this Diablo clone stand out! This is an intensely fun blast -em up, but only if you play with others. Single player mode is not how this title is meant to be played. Playing solo reveals the repetitive nature of the game mechanics very quickly. 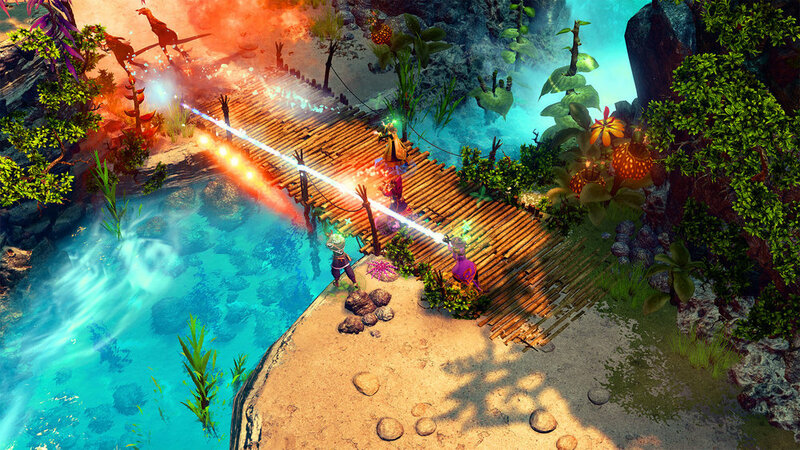 Nine Parchments enables four players to cooperatively work through the levels together, collecting loot and chaining brightly colored spells together. 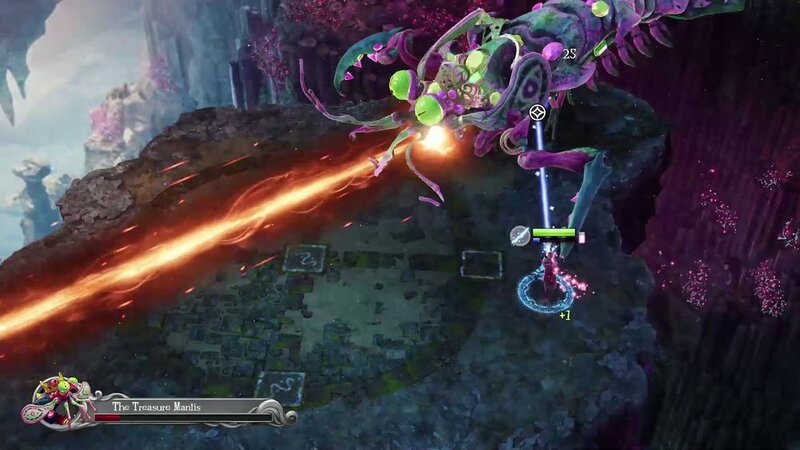 Gameplay works in a similar way to Diablo, you move your wizard-in-training from one end of the level to another, blasting various enemies along the way and encountering boss battles, which act as milestones. When you defeat the bosses, you will gain one of the nine missing parchments. The combat revolves around a fairly simple elemental system -Fire beats Ice for example-, and combining the elements with your co-players is key. As stated before, co-op is really the only way to play through this title as you'll be combining strategies and creating colourful chaos as your spells weaving together and destroy everything on the screen. Attacks are categorized by long range continuous blasts of energy or short bursts that do more damage with each hit. These are selected by using the rotational system triggered by the mouse wheel or the side buttons of your controller. There are also close combat melee style attacks which generally do very little damage, so you are better not using these at all and I wonder why they were included at all. There's a fatal and massive flaw present in this title. You can only have one campaign running at one time. If you switch between single player and multiplayer modes, you will lose all your progress in the game - you ALWAYS have to start back at the beginning again. You do keep all your unlocked weapons and items and upgrades that you have previously earned. However, in order to see the story through, you must complete it entirely in either single player mode or multiplayer mode exclusively. Coming from the developers of Trine, I knew that I was in for a visual spectacle when playing through this title. This is a beautiful and brightly colored game which can overwhelm the player in an incredibly positive way. I loved the vibrancy of the game which resonates with the consistency of the overall atmosphere of the title. The bosses are imaginative, well designed and inspired. Taking them down, feels epic and satisfying. There's hardly any framerate drop on the PC version (Intel 6700K, GTX 1080 at 4K) running at 60 FPS, and the visual effects are nothing short of stunning at times. It's not a game that I would play through as often as Diablo. None of the eight characters resonated with me. The classic elements of an RPG, the skill trees and leveling up system are all present, but it seems very simplistic - which may be a strength as it's not a complicated system, but I would have preferred more substance in this area. Nine Parchments had a lot of potential, at some points fulfilled and others were a bit of a missed opportunity. The combat is incredibly exciting and fun, the multiplayer aspects are inspired and works really well and the gorgeous visuals and artwork bring forth a world which is engaging to explore. The level design is repetitive, however, and the strange decision to not allow the player to continue in the narrative if they switch between game modes greatly lessened the experience for me. If you enjoy a multiplayer co-op experience and don't mind a light RPG experience, you might have an amazing time with this title, just remember the above shortcomings before you buy .